Can student loans be included in your bankruptcy? Yes, everyone you owe must be included in your bankruptcy. The real question is can student loans be discharged in a bankruptcy? The answer is probably not, but maybe. For cases filed after October 7, 1998, Student Loans are dischargeable only if you can prove that having to repay it would impose an "undue hardship" on you . Cases filed prior to October 17, 2005, if the program under which your student loan is issued, insured, administered is a for-profit, private (non-government) entity, it may be dischargeable. However, if the program itself receives nonprofit funding by participation of nonprofit entities, the loan is not dischargeable in bankruptcy. Student and educational loans can only be discharged in bankruptcy if the following can be proven at trial. 3. That you made good faith effort to repay the loans. This does not just include making payments on the loans. It requires doing things over time such as making efforts to increase your income (which includes going back to school to get additional degrees or experience), consolidating loans with the Direct Loan Servicing Center, and other similar efforts. Courts do have the authority to issue partial discharges of student loans, in cases where the debtor shows the ability to repay some, but not all, of the loans. All three of the above factors must be still be met not matter if it is partial or complete discharge of the student loan debt. It is very difficult to prove all the necessary elements for the student loan hardship discharge and thus it is very rare to discharge student loan debt. (4) The taxes were not assessed within the last 240 days. Again, discharging taxes is an extremely complicated area, and you should definitely consult with an attorney before deciding whether to file based on dischargeability of your taxes. This foreclosure solution costs taxpayers NOTHING. Over 6,600 American families a day are losing their homes to foreclosure. will be lost to foreclosure, unless we do something now. If we don’t, the value of all of our homes will keep going down and our neighborhoods will suffer. to change bad mortgages so struggling homeowners can save their homes from foreclosure. The result? Fewer foreclosures and more stable home prices for all of us. Reduce home foreclosures at no cost to taxpayers. The mortgage modification proposal has been endorsed by leading economists, 22 state Attorneys General, state and local elected officials, newspaper editorial boards from around the country and nearly 100 leading national organizations representing seniors, consumers, religious affiliations, financial professionals, working families, and civil rights and housing groups. Paid for by the National Association of Consumer Bankruptcy Attorneys, Inc., a nationwide organization dedicated to protecting the rights of honest, hard-working, financially distressed Americans. Go to www.nacba.org/S61 for more information about the bill and how you can help get it passed. The Law Office of Erich M. Niederlehner, PA, is proud to announce the opening of its new office in Fort Walton Beach, Florida. The location of the new office is 16 Ferry Road, S.E., Fort Walton Beach, Florida 32548. The new office is on the corner of Ferry Road, S.E. and Fourth Ave. The office is in the Appraisal House, which is directly behind Embarq telephone company off of Hollywood. 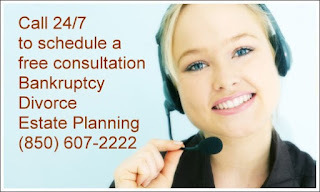 Please call 850-607-2222 24 hours a day to setup a free consultation regarding Bankruptcy in either of our two current offices. Stay tuned for more locations which will be opening soon. It has been a while since my last posting on the Got Debt? Blog. I have been so swamped with clients I have not had the chance to make any recent postings. I do intend to start posting information on a more regularly. I would like everyone to note the blog has a new address. Instead of www.GotDebtPensacola.blogspot.com the new address is www.GotDebtBlog.com. This new address is shorter and easier to remember. Also, the website www.GotDebtPensacola.com has been updated with plenty of new information on Bankruptcy, Divorce and Estate Planning. So check it out if you are wanting more information on any of the subjects. As always the Pensacola Bankruptcy, Divorce and Estate Planning attorney Erich M. Niederlehner, provides legal services to the citizens of Pensacola and the surrounding areas of Florida. To schedule a free consultation to discuss your legal issues with Erich M. Niederlehner, please call 850-607-2222. The Law Office of Erich M. Niederlehner, PA, is located at 113 North Palafox Street, Pensacola, Florida 32502. Call us today for a free consultation.